We drove over to Tintagel to see the Castle and parked in the car park a short walk away from the St Materianas church. 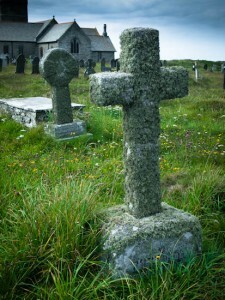 I was fascinated by the gravestones which had a lovely coating of fine light green lichen. Taken with the handheld Olympus EP-2 and 14-42mm lens. 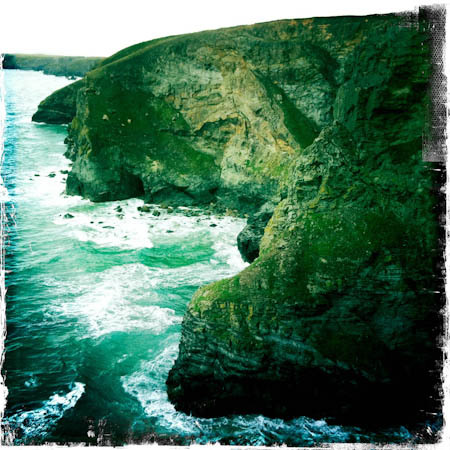 This was taken on a coastal walk to Bedruthan Steps (29 August 2011). 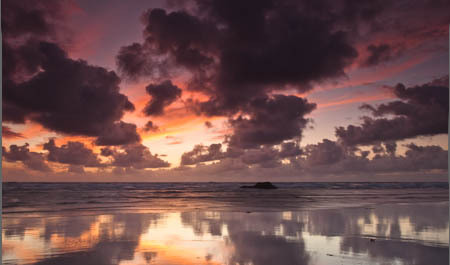 I went over to photograph the sunset but hadn’t done my research and the tide was fully in so I couldn’t get on to the beach. It’s at a spot on the way back to Mawgan Porth. I won’t take full credit for this one, my lad influenced the shot. I’d taken some photos of the wall and separate ones of the sunset and he’d been watching and said why don’t you take a shot from an angle and include the sunset. I could have kicked myself for missing an obvious opportunity. It was taken with the Olympus Pen EP-2 and is a 5 frame HDR merged in Photomatix. I woke up at 7am this morning with the intention of going for a jog with my lad. His alarm went off but he went back to sleep. 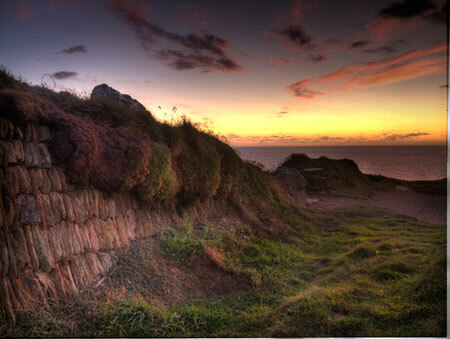 So I ran alone and headed over to Bedruthen Steps on the Coastal path. This shot was taken with the iphone of the view of the cliffs on the way over. It was the first and last time I wanted to jog early in the morning! So the Solar panels have been in for a week now, and today it’s rained most of the time so the energy being generated is a little low. But in one week I’ve fed 104Kwh back into the grid and despite using electricity in the house my house meter is 10 units back. So it’s starting to work. £50 earned so far and no electricity spent. 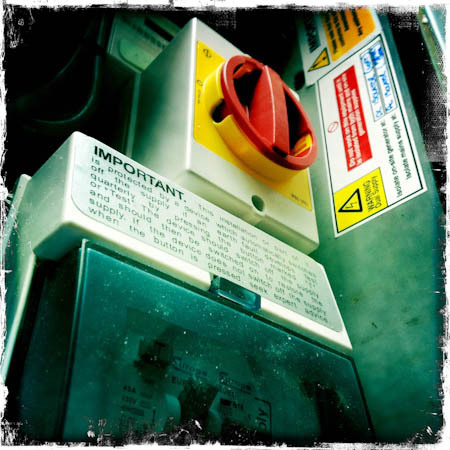 Today’s photo is a a shot of the new consumer unit with AC isolater and warning stickers. 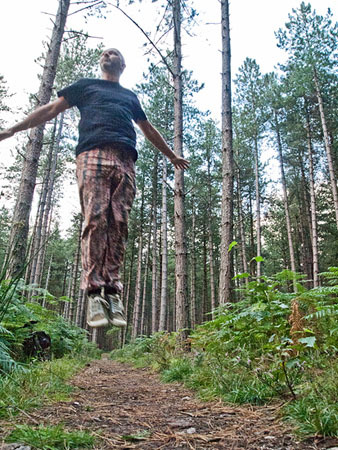 I decided to start to improve on my levitation skills. 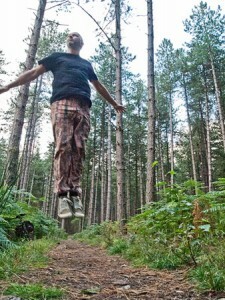 So this evening I cycled off into Clumber to do some woodland levitation. I’ve admired the work of the highly creative ePHOTOzine member Beckas and the world famous Miss Aniela, but a few weeks ago I stumbled on the work of a Japanese photographer yowayowacamera Her work is more raw and natural everyday looking. So I’m going to attempt to recreate that look. In my practice run I realised it can be done in daylight without flash but a fast shutter speed is necessary and tonight the light wasn’t bright enough without going in to the higher noisy ISO settings of the Olympus EP2. So I had a choice of noisy or blurred. 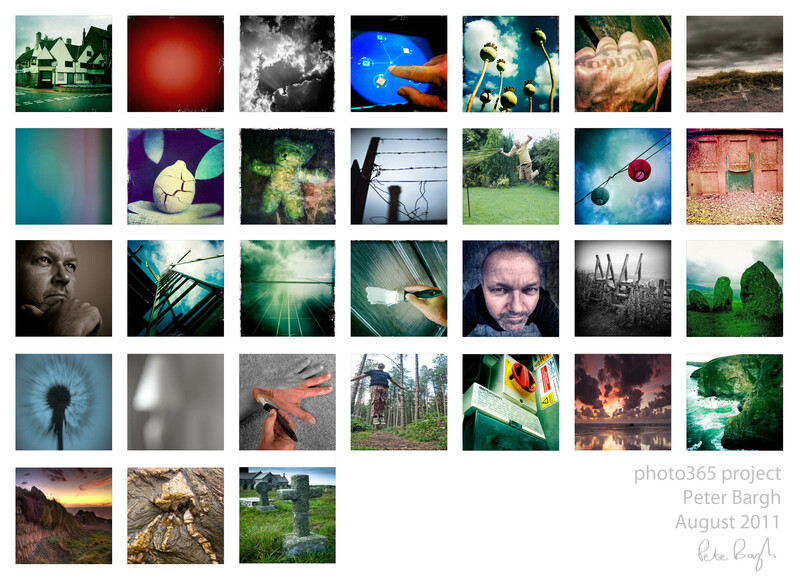 I took several pics with each option and preferred noisy. Then you have issues with timing. I was alone so the camera was mounted on a mini tripod and the self timer set. I jumped after a count of four when the red light started to flash. Being in the right place at the right moment using this method is hard work. And then thirdly the big skill is adopting a natural looking mid flight pose. I had shots with buttocks clenched, tongue out, hands stretched unnaturally, fists clenched, neck tensed and just about any other unnatural looking features. Look at the work of that Japanese girl she’s incredible. It’s as though someone has just picked her up bent a few joints and stuck her on the spot. That as you see if you have a go is quite a talent in itself. To get the height I positioned a sawn log just out of view and jumped up off that to give me a bit of a higher starting point. This is my best attempt…noisy, chopped off limb, and slightly unnatural pose but it’s not too bad! 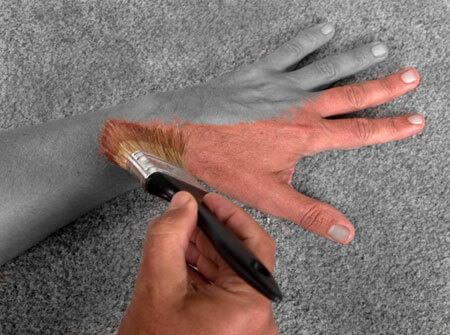 A simple idea where you desaturate part of the picture and make it look as though you are painting colour onto it. I set the Olympus E-P2 camera up on a tripod and on the two second delay. Positioned the left hand in shot so the camera could focus on the correct position and then pressed the shutter and moved my right hand in to place to do the painting. I then opened the photo in Photoshop duplicated the layer, created a layer mask on the duplicate. Desaturated the layer and then erased the mask so the colour layer below showed through in the necessary areas. I used a brush with a rough edge to paint the mask away so it looked more like paint. I also selected the skin colour as the brush paint colour and painted that onto the bristles of the brush so it looked like it was loaded with paint. I bought a Micro 4/3rd to T2 adaptor to use on my Olympus E-P2 the other day. I was messing around with different lenses and added a El Nikkor 50mm f/4 enlarging lens on the front. I just held it in place and it provided a very close focus. Infinity was way out of focus. I could move it forwards to blur even more. 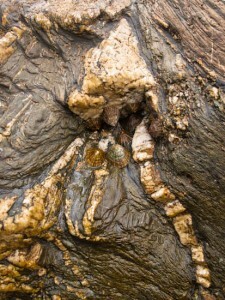 I started to experiment with the out of focus views and wandered around the house looking for interesting abstracts.  This was one of them…a reading lamp. There’s a skill to getting out of focus subjects looking interesting. I hope you think I achieved that here.